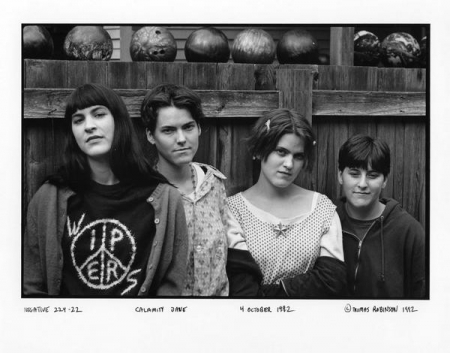 Calamity Jane was an all-female American grunge/punk band, formed in Portland, Oregon, United States, in 1989. Gilly Ann Hanner (vocals/guitar) and Lisa Koenig (drums) started playing together as a band in 1988 along with Ronna Era (bass). After a few live appearances Hanner's sister Megan took over on bass and the band was renamed Calamity Jane the following year. Their first gig was supporting Scrawl. The band then supported Fugazi on their 1990 tour. The band released three singles and an album Martha Jane Cannary with their original line up, and a final single with Marci Beesecker (aka Marci Martinez - later of Team Dresch) on drums and Joanna Bolme (later of Quasi and The Jicks) on bass. The band played two support slots with Nirvana. One of these shows, in Buenos Aires, Argentina, ended in Calamity Jane being booed off the stage, which motivated Nirvana to intentionally sabotage their own performance.